BIG news out of China is an exposed mess involving murder, embezzlement, bribery, abuse of high political power, and a love triangle gone bad. And since it is Communism, of course, the story includes defection. With his estranged wife holding a suspended death sentence for murder, disgraced politician Bo Xilai, just completed his last day on trial for crimes committed while holding high political office. Fallen Chinese politician Bo Xilai detailed an illicit relationship between his former second-in-command and his wife as China‘s biggest political trial in three decades came to a close on Monday. State media said the verdict would be announced later. As Bo’s trial entered its fifth and final day in Jinan, Shandong province, the 64-year-old former Communist party boss strongly denied charges of bribery, embezzlement and abuse of power in a closing statement riddled with stinging attacks on prosecution witnesses. The trial, originally expected to be staid, has exposed severe dysfunction within Bo’s family and detailed the complicated tangle of allegiances and affairs that led to his downfall. Bo’s downfall was set in motion in November 2011 when his wife, Gu Kailai, murdered British businessman Neil Heywood in the south-western metropolis of Chongqing, where Bo was Communist party chief. On Sunday, Bo and his former deputy, Wang Lijun, police captain of Chongqing, offered conflicting accounts of a confrontation between the two on 29 January 2012, after Bo was informed of the murder. In court, Bo said Wang’s defection was motivated by his affair with Gu. “He was consumed with these feelings and couldn’t control himself,” Bo said. “He knows my personality. He invaded my family, invaded my basic emotions. 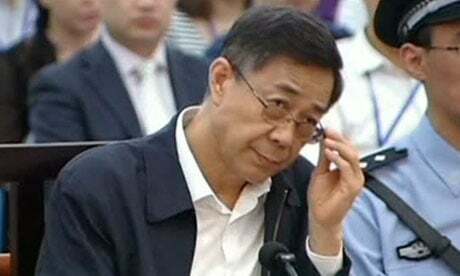 This is the real reason he defected.” Bo was accused of stripping Wang of his post as Chongqing’s police chief and deputy mayor in 2012 without the approval of higher authorities, as well as fabricating medical records to demonstrate Wang was insane. Bo maintained that he thought Wang had framed his wife, and that he sacked the police chief because of “five, six issues” unrelated to the murder, including suspicions that Wang was mentally unstable.